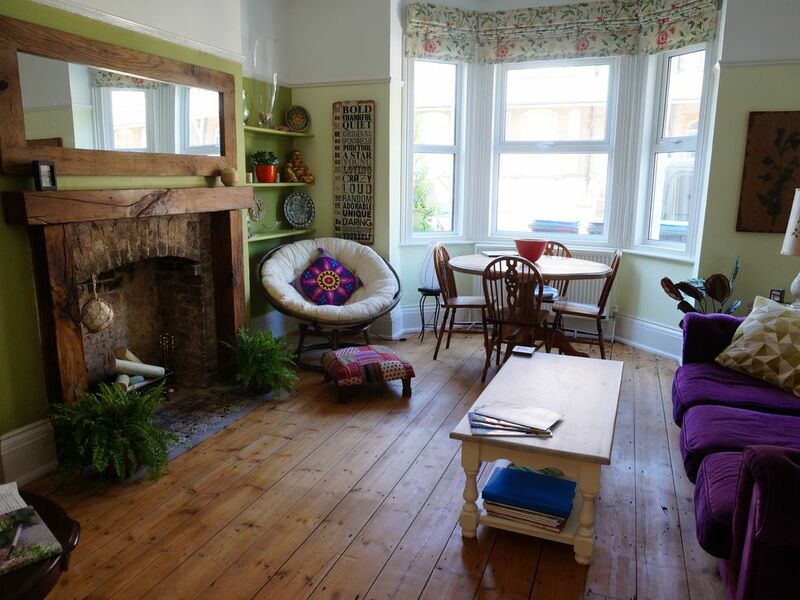 This 2 bedroom ground floor apartment set in a Victorian house consists of a large living room/ dinning room with a original victorian fire place. The first bedroom is a double and is on the ground floor, the second is a large twin bedroom on the lower ground floor. The bathroom and toilet has been recently renovated and is now a contemporary wet room. The kitchen is well equipped with dishwasher, washing machine, fridge- freezer, microwave, ceramic hob,oven etc. This holiday apartment also has its own private patio area full of flowers, with garden furniture ideal for relaxing. It is also very safe for children. There are many points about this holiday apartment that make it unique . It has a perfect location in a wonderful village due to its central location the apartment is a perfect base for sight seeing the Kent coast. It has been recently renovated to a very high standard. This holiday accommodation is completely wheelchair accessible and has been design in such a way that makes it stylish and usable to all. We came to Westgate On Sea to visit family who live in the area. From start to finish communication from Anna was great. On arrival we were greated by Claire who was so welcoming and nothing was to much trouble. The flat itself was lovely,very homely with everything you could need to make your stay enjoyable. I particularly loved the interior which made you feel relaxed from day one. Great location for us as a family which meant we could see parents,children and grandchildren very easily. Thank you so much for taking your time to write us this lovely review. Yes Westgate is such a lovely, family orientated place, and we feel lucky to have a little piece of it. You have been a great guests and we do hope to welcome you one day soon. I loved it and so did the rest of my family. Lovely apartment in a fantastic location. Our family of 4 had plenty of room and really appreciated the personal touches and stylish decor that gave the property a quirky and cosy feel. Anna and Clare were exceptionally helpful and quick to respond to our queries. We would definitely return and thoroughly recommend Sands Apartment. Wir hatten einen unvergesslichen Aufenthalt in Annas Wohnung. Ich habe selten so liebevoll und ästhetisch eingerichtete Zimmer gesehen. Die Wahl der Farben, Stoffe und der Dekoration ist einfach umwerfend! Alles war so, als wäre es nicht für Gäste sondern für sich selbst eingerichtet. Die Lage in Westgate-on-Sea ist über jeden Zweifel erhaben: Man ist innerhalb kürzester Zeit am Strand oder bei Shops aller Art und wenn man möchte auch in zwei Minuten am Bahnhof. Wir wurden sehr freundlich empfangen und es fehlte an nichts. Auch für Kinder und Hunde ist die Wohnung uneingeschränkt geeignet. Allerdings sind alle Strände in der Umgebung nur bis 10 Uhr und ab 18 Uhr für Hunde freigegeben; das kannten wir von Cornwall und Wales anders. Wir werden bei Gelegenheit gerne wiederkommen! SUCH A FANTASTIC LOCATION RIGHT NEAR THE SEA. Located in Westgate with its charm and beauty this small seaside town offers a good selection of shops selling local produce, cafes, cinema, hairdressers, gifts and antiques. With its own mainline railway station the location offers easy access into London and only one stop away from Margate with its golden sands and award winning Turner Gallery. Westgate has two bays with sand stretching across each making it ideal for walkers and bathers.